Hinckley was Born in Milton, Massachusetts, on 4 November, 1813 to a father, a retired sea captain, who sent him to Philadelphia at the age of fifteen to be apprenticed to a merchant. While there, he took evening classes with William Sanford Mason. Returning to Milton in 1831, he became a sign painter. After his father’s death in 1833 he decided once and for all to become an artist. He worked initially as a portraitist. In 1838 he began selling portraits of dogs, which met with approval from his patrons and others. He began specializing in portraits of animals, particularly dogs, game and cattle. Later in his career he was also known for his genre pictures, urban scenes and, to a lesser extent, landscapes. A visit to Europe in 1851 brought him into contact with the works of the Flemish masters and Edwin Landseer. Aside from his European journey and a trip to California in 1870 to sketch elk, he lived and worked primarily in Milton, where he also raised chickens and vegetables. Hinckley seldom exhibited, finding a ready enough market for his work among gentleman farmers, many of whom commissioned him to paint their cattle or dogs. He did, however, show two hunting scenes at the Royal Academy in London in 1858. 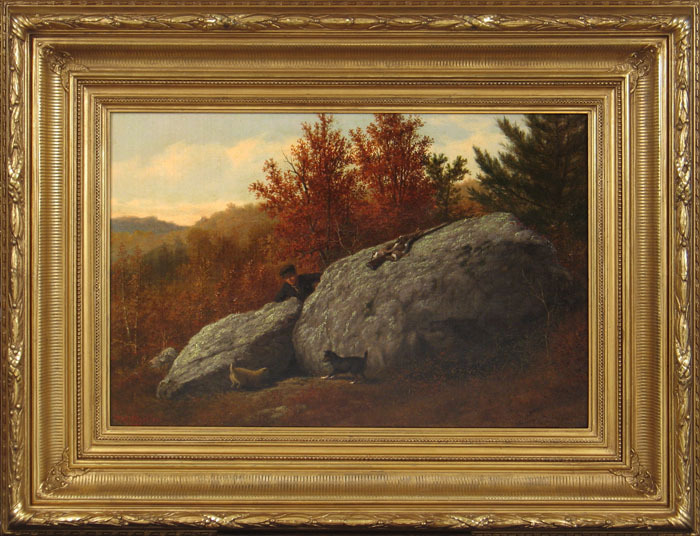 He also exhibited at the National Academy of Design and the Pennsylvania Academy of the Fine Arts, showing his Picture of Two Dogs and Dogs and Game--Scenery in the Neighborhood of Milton, Mass at the latter in 1848 and 1855 respectively. The National Museum of American Art at the Smithsonian Institution has his Disputed Game. His Sheep Grazing--Cows Lazing is in the Shelburne (VT) Museum, his Deer in a Landscape is in the North Carolina Museum of Art in Raleigh and the Brandywine Museum in Chadds Ford, PA has his Bull. Other institutions holding his work include the Boston Museum of Fine Arts, the New York Metropolitan Museum of Art and the Corcoran Gallery in Washington, DC. Hinckley died in Milton on 15 February, 1896.